You are currently browsing the Carpe DMM blog archives for November, 2011. “All Our Yesterdays” is an episode I remember well because I had the Fotonovel version of it when I was a kid. Watching it again was actually pleasant, because of the feeling of nostalgia, and the fact that I think this is a decent episode. It starts with Kirk, Spock, and McCoy beaming down to a planet that is about to get destroyed by its sun going nova in a few hours (timed to the minute by the Enterprise, apparently). There’s supposed to be a large native population without spaceflight technology, but they seem to have all vanished. In a library, they find only one old man, Atoz, and a couple of his clones, who keep talking cryptically about hurrying up and getting to safety. Kirk never sits the guy down and asks him a straight question to find out what happened to everyone, so this part is a bit farcical, but it does build the mystery. The library is full of memory discs, which show images of the planet’s history. 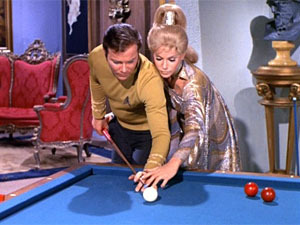 While viewing one, Kirk hears a woman calling for help from through an archway, and of course races off to investigate. Spock and McCoy follow hot on his heels. Kirk appears in a street populated by people out of witch hunt Salem, and fights off some ruffians who are harassing a woman. Spock and McCoy appear in a snowy wilderness. They can talk to each other, but can’t get back to the library. Kirk gets into a sword fight, and is captured and thrown into a cell, where a prosecutor comes to accuse him of witchcraft. Meanwhile, McCoy starts freezing to death (despite Spock being the one from a hot planet and unused to the cold) and he and Spock trudge through the snow until they meet a mysterious figure clad in furs. It turns out to be a beautiful woman named Zarabeth, who Spock starts falling in love with when she strips down to a few strategically placed scraps of leather. The story makes little sense to this point, but suddenly the pieces start falling into place. Kirk mentions to the prosecutor that he came from the library, and the prosecutor lets slip that he knows about it. He explains that everyone fled the nova through a time portal, so they could live out their lives in their own planet’s history. Spock and McCoy must have gone to a different time period because they were looking at a different memory disc. The prosecutor explains Kirk can never go back because his molecular structure has been changed by a machine in the library to suit the new time he is in, but when Kirk says he underwent no such process, the prosecutor tells him he must hurry back or die. He takes Kirk to the portal and Kirk finds his way back, where Atoz is most upset and tries to keep pushing him back through. Kirk orders Atoz to locate the ice age disc so he can get Spock and McCoy back. But in the ice age, the normally vegetarian Spock is eating meat and kissing Zarabeth and getting mad at McCoy, who keeps insisting they try to get back. Zarabeth says they can’t go back, and Spock meekly agrees. McCoy argues that Spock is losing his logical mind because they’re 5000 years in the past, when Vulcans were still savages. This is a cool bit of storytelling logic, but it would have made more sense if Spock’s molecular structure had been altered to match 5000 years ago. Anyway, McCoy convinces Spock to look for the portal, conveniently just as Kirk locates the right disc, and they return to the present after a sad farewell to Zarabeth. Atoz dashes into the portal, and the crew beam back and warp out just before the sun explodes. There are some plot holes, including the fact that Atoz keeps trying to push Kirk through the portal without adjusting his molecular structure, and the whole miscommunication thing with him. But those aside, I really like this episode. It has mystery, drama, conflict, a cool use of time travel, and it kinda makes sense. I call this one a winner from season 3. Tropes: Literary Allusion Title, Ancient Keeper, Cloning Blues, Portal Door, Flynning, Changed My Jumper, Burn The Witch, Girl Of The Week, Fur Bikini, Cool Gate, Trapped In The Past, Temporal Sickness, Get Back To The Future, Veganopia, Meat Versus Veggies. “The Savage Curtain” is another episode I didn’t remember any details of until after I started watching it, and then it was not until about halfway through that I remembered the remaining major plot elements. It starts with the Enterprise surveying a dull and supposedly lifeless volcanic planet, only to find Abraham Lincoln, complete in monumental chair, appear on their viewscreen as if floating in space. He asks to be beamed aboard, and Kirk displays an odd reverence for what is presumably an alien trick by according “Lincoln” full presidential honours. There’s an interesting point when Lincoln asks if they still measure time in minutes, and Kirk says “we can convert”. 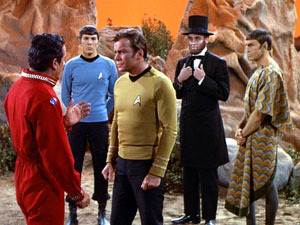 After some time filling byplay on board, Kirk, Spock, and Lincoln beam down to a mysteriously habitable area on the planet, where they meet Surak, a similarly long dead and revered Vulcan. The jig is revealed to be an experiment by one of the natives of the planet, a semi-omnipotent being made of rock. It wishes to understand the strange carbon-based concepts of “good” and “evil”. Of course, what better way to do this than to arrange an involuntary battle to the death between representatives of both sides!? (That’s an average of 2.33 involuntary battles to the death per season of Star Trek!) Ranged against kirk, Spock, Lincoln, and Surak are Genghis Khan and three fictional evil dudes (though one is a dudette). 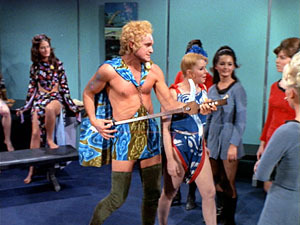 When Kirk objects and refuses to fight, the rock alien threatens the Enterprise with destruction unless they play along. In the opening fist fight before the factions retreat to build weapons, Spock once again gets to fight the girl. Given time to discuss and plan, Lincoln argues they should fight dirty, citing his experience as a wartime President and arguing that anything goes as long as good wins. Surak argues otherwise and wants to go talk peace with the evil guys, insisting it is the only way. When he inevitably gets captured, Lincoln bravely goes to the rescue. When he inevitably gets captured, Kirk and Spock bravely go to the rescue. Lincoln warns them it’s a trap before getting a spear in the back, then Kirk and Spock duke it out one last time, managing to kill the evil leader, which causes the other three to flee. The rock alien pronounces judgement, saying that there’s no difference between good and evil as far as it can see. Kirk points out that they were fighting to save their comrades, while the baddies were fighting for power. The rock alien dismisses them, apparently learning nothing at all from its experiment. The ending is really rushed and pointless, which seems wrong given the padding at the front of the episode. They could have restructured it to make it hold together better, but there’s probably not much point as it’s pretty uninspiring stuff that smells like reheated plots from a half-dozen other episodes. Tropes: Two Of Your Earth Minutes, Famous, Famous, Fictional, Sufficiently Advanced Alien, Starfish Aliens, Blue And Orange Morality, Involuntary Battle To The Death, Archived Army, Would Hit A Girl, Reluctant Warrior, Actual Pacifist, Good Cannot Comprehend Evil, Voice Changeling, Dirty Coward. Body count: Surak, Abraham Lincoln (both killed by the evil guys). “The Cloud Minders” is another anvilicious episode along the lines of “Let That be Your Last Battlefield”. The moral here is again anti-prejudice and discrimination, played out between an elite ruling class and a lowly working class. Literally lowly, in an almost painful piece of symbolism, as the rulers live in the beautiful cloud city of Stratos, while the workers (called Troglytes) toil in the mines on the surface of the planet Ardana. The Enterprise is there to collect supplies of the mineral zenite, which is the only cure for a plague threatening to wipe out all vegetation on some other planet. Kirk and Spock ignore the Ardanian request to beam down to their clod city, and instead go to the mines, where they are attacked by disgruntled Troglytes led by Vanna, who Spock gets to fight in a rare case of the crew fighting hand to hand with a woman. The High Advisor of Ardana, Plasus, rescues Kirk and Spock with a security team and takes them up to the safety of the city, which is all crystal spires and togas, setting up the urban segregation of this crapsaccharine world. Here they meet Plasus’ daughter, Droxine, who wears a startlingly revealing light blue outfit that has Spock going google-eyed in a most out-of-character way, complete with some cringeworthy flirting dialogue. There’s some revelation of the plight of the Troglytes and bigoted dismissal of concern by Plasus, leading to a persecuted Troglyte jumping off the city and plummeting to his death. Spock goes all introspective, weighing up the beauty of Droxine against the ugliness of the society she inhabits. There’s even a Gilligan cut of Plasus assuring Kirk there is no violence in their society, followed by a shot of him torturing a captured Troglyte. It’s a pretty lame episode. The moral is worthy, but it’s heavy-handed, and developed in annoying ways. Spock’s character is almost completely subverted as he basically turns into a lovestruck moron. Kirk interferes with a Federation member’s government with impunity. The plot idea is actually kind of good, but it’s not treated right. Tropes: Anvilicious, Unobtainium, The Plague, Would Hit A Girl, Crystal Spires And Togas, Urban Segregation, Crapsaccharine World, The President’s Daughter, Theiss Titillation Theory, Character Derailment, Gilligan Cut, Agony Beam, Screw The Rules, I’m Doing What’s Right. Body count: One Troglyte (suicide by jumping from Stratos). “The Way to Eden“… and so we move from one of the best episodes of season 3 to one of the worst. It has space hippies and six, count them… six groovy musical numbers, including Spock playing along while the hippies and Enterprise crew dance. The hippies arrive on the Enterprise after being rescued from a stolen ship. They are seeking the mythical paradise planet of Eden, and behave in a very 1960s anti-authoritarian way, including some far out slang. Spock, weirdly enough, is the only crew member who gets along with them, as we see his spiritual side and curiosity come out. He also pulls out a Vulcan harp to jam with the hippies and their wacky musical instruments. During one of the musical numbers, we see Sulu on the bridge tapping his toes and grooving to the rhythms, implying that they are broadcasting them throughout the ship for no apparent reason. The story, as far as it goes, is that the leader of the hippies (though he refuses to be called a leader, saying that they are all equals) is the previously respected Dr Sevrin, a former professor of acoustics, who has rejected civilisation and wishes to find Eden where they can all live in harmony. McCoy finds in a medical examination that Sevrin is a carrier of a fatal infectious disease, which Sevrin denies exists in a deniariffic act of denying denial. McCoy wants to isolate Sevrin lest he infect his followers or anyone else he comes into contact with, which upsets the hippies. (While confined, we even see the brig guard toe-tapping to the piped music from the hippie/Spock jam session.) One of the hippies is an old flame of Chekov’s and there’s a minor subplot about how they don’t understand one another any more. Of course, Sevrin escapes and the hippies take over the ship from auxiliary control, disabling the main bridge with ridiculous ease. Sevrin uses a sonic attack to cripple any resistance and takes the ship on a wild ride through the Galaxy until they find a planet that he claims is Eden. How he knows this is anyone’s guess. The hippies steal a shuttlecraft and go down to the planet, which looks nice enough when Kirk and Spock go down to chase them. There is a comment about Sulu being interested in botany – the first we hear about that since way back in season 1. But the beautiful vegetation is acidic and poisonous, and the hippie Adam and then Sevrin die after eating some of the fruit. Eden is an illusion, and the remaining hippies are left to find their own way again. Wow, it’s just a horrible episode. The hippies are straight out of the 60s, just dressed in wacky space clothes variants of hippie garb. The musical numbers are obvious filler. The Enterprise operational procedures and security make no sense whatsoever. Kill me now!! Tropes: Musical Episode, Pleasure Planet, Future Slang, Xenophone, Cult Colony, Typhoid Mary, Science Is Bad, Selective Obliviousness, New Old Flame, Cardboard Prison, Brown Note, Poison Is Corrosive, Death World, Reactionary Fantasy, No New Fashions In The Future, Filler. Body count: Adam, Dr Sevrin (both from eating poisonous fruit). On the planet they are attacked by a robot (shades of Robby, or Ariel/Caliban), and saved by an old man calling himself Flint (shades of Morbius, or Prospero). He first angrily orders them to leave, but changes his tone when Kirk insists at phaser-point on finding a cure for the fever. Flint invites them to his home while the robot, M-4, gathers and processes the ryetalyn in a technicolour science lab. Is his amazingly well-appointed home (he even has a flat-screen TV! ), Spock is amazed to see what are apparently original works by Leonardo da Vinci, Shakespeare, and other famous historical artists. In a turnabout, Kirk is concerned with science (the ryetalyn), while Spock is preoccupied with art. Kirk is equally amazed to see the beautiful Rayna (shades of Altaira, or Miranda), Flint’s young ward, who he immediately begins seducing. He dances with her as Spock plays an original piano composition written in the unmistakeable hand of Brahms. Although beautiful, Rayna is probably the most clothing-covered girl of the week yet seen in the series. Things are looking good until McCoy reports that M-4 has botched the ryetalyn and M-4 decides to try killing Kirk. He phasers it, and Flint appears to apologise. Suspicious now, they search behind a forbidden door that Rayna had indicated earlier, finding primitive versions of Rayna, now revealed to be an android! Not only The Tempest, but also Pygmalion! And Flint is revealed to actually be Leonardo, and Shakespeare, and Brahms, and thousands of years old! It turns out Flint has created Rayna to be his companion and assuage his immortal loneliness, but needed Kirk to stir her emotions so that she would be a real woman. Rayna enters the forbidden room and discovers the secret about her own creation, turning her against Flint as he talks to Kirk about her in the third person while she is present. Kirk and Flint fight and Rayna is so torn between her loyalties that her circuits overload and she dies. Kirk and Flint are both shocked. Flint, now distraught and alone, lets them leave with the ryetalyn. Kirk is depressed too, having fallen in love with Rayna. In the closing scene, Spock uses a mind meld on Kirk as he sleeps, and says the word, “Forget…” – a touching variant on the famous “Remember” line he would utter at the end of The Wrath of Khan. I really enjoyed this episode. The story is decent, the mystery is intriguing, the revelation is clever, and the execution is pretty well done. This is definitely one of the best episodes of season 3, IMO. Tropes: The Plague, Technicolour Science, Girl Of The Week, Forbidden Fruit, Robotic Reveal, Robot Girl, Pygmalion Plot, Julius Beethoven Da Vinci, Beethoven Was An Alien Spy, Really 700 Years Old, Who Wants To Live Forever?, Disney Dog Fight, Logic Bomb, The Dulcinea Effect, Laser Guided Amnesia. Body count: 3 Enterprise crew form Rigellian fever pre-credits, Rayna.